Hearing “Ice Ice Baby” by Vanilla Ice on the radio this week – hello 1990! My three kids are unintentionally competing for cleanest room in the house (nothing I actually put them up to)– folks, this is highly irregular! I almost hate to admit how much joy a clutter-free room provides. Receiving a surprise delivery of a giant cookie basket in the mail. An evening of wine and laughter (and a few tears) with two of my favorite gals. Sunsets and sunshine. Both have been unbelievable recently. Given the frigid weather around the country recently, I feel especially grateful. I wish I could bottle and share both! And, as always, books make me smile. Right now I’m reading two great books: The Signature of All Things by Elizabeth Gilbert, and Basilica by R.A. Scott. I love Elizabeth Gilbert for so many reasons, reading her new piece of fiction feels like visiting with an old friend. Basilica details the building of St. Peter’s — it’s reader friendly and fascinating. Perfect for this gal who loves history and all things Italian. 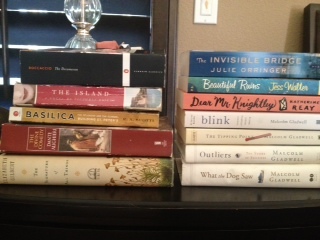 Something about a new year makes me want to jump into a new pile of books. Ready, set, read! My stack of currents and futures for the coming year. Previous post ← Prayers and Piazzas: What’s it all About? xoxo back dear friend. Enjoy this lovely day. Ice Ice Baby ALWAYS makes me sing and smile!! Wine without me??! Lunch this week? A giant cookie basket in the mail?! What can be better than that? !